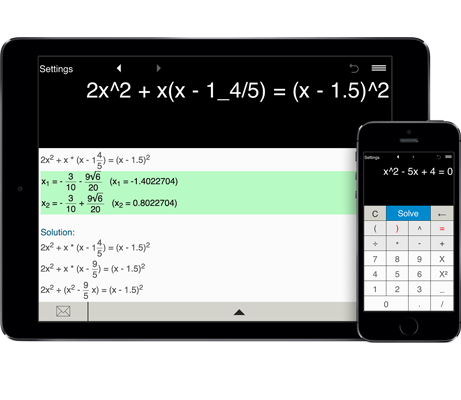 Advanced quadratic equation calculator with steps. Solves linear and quadratic equations with fractions. Need help solving quadratic equations involving fractions? Use a free quadratic equations calculator to solve quadratic equations with fractional coefficients. ax2 + bx + c = 0, ax2 + bx = 0 and ax2 + c = 0. Quadratic equation calculator solves quadratic equations using the quadratic formula. Quadratic equation calculator can be used to solve quadratic equations containing whole, decimal and fractional coefficients. To find the roots, enter the coefficients of your equation, click Solve and quadratic equations calculator will display the detailed solution.